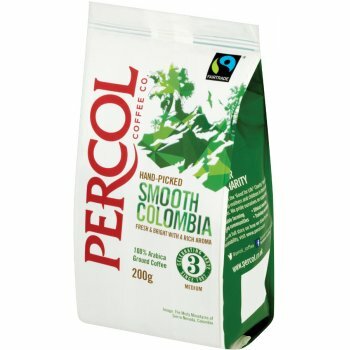 Percol coffee was launched in 1987, as a collection of superior coffees for amateur coffee lovers and coffee aficionados alike, designed to suit different times of day and to match your mood. Their coffee beans are sourced from small plantations around Central and South America, where the beans grow organically and naturally, and are allowed to develop their full, natural character. As well as championing environmental sustainability, Percol is dedicated to ethical trading. The company was a pioneer of Fair Trade in the UK, and is very proud of its Fairtrade certified coffee. Percol coffee aims to take you on an adventure to foreign lands with its array of tastes, intensities and aromas, designed to stretch your taste buds and enrich your understanding of one of the nation’s favourite drinks.